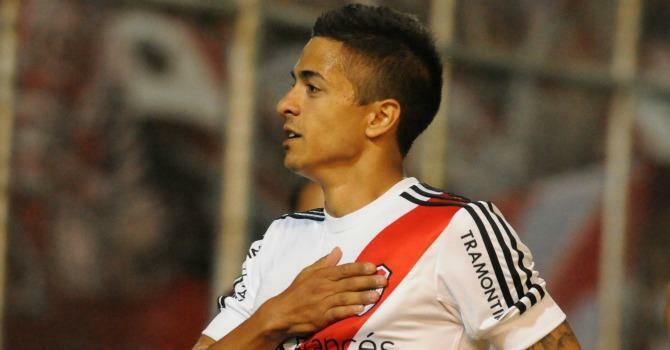 River Plate’s young playmaker, Manuel Lanzini has finally left El Monumental but it was not a move to one of Europe’s top clubs, as has long been expected. Instead, UAE club, Al Jazira have paid $10 million for the talented 21-year-old. Lanzini has a great deal of potential and although he is criticised at times for going missing in games, it is easy to forget that he is still only 21. His progression since making his debut for River as a 17-year-old has not perhaps been as quick as had been thought and so a move might be beneficial. However, without wanting to discredit the league in the UAE I am not certain that a move to Al Jazira is one that will see him realise his true potential. Certainly for River, the deal is a good one. $10 million is too much for the club to turn down and although after deductions and the fact that River own 80% of the player, it would be closer to $6 million it is still a considerable fee. It is no secret that River need the money and this enables them to break even so it appears to make sense. Financially for Lanzini it also makes sense. Playing in Argentina and earning in pesos will see him making a fraction of the amount that he will make in the UAE but on a footballing level it is a little disappointing. Lanzini has for a long time been linked to some of Europe’s top clubs. Borussia Dortmund, Chelsea, Tottenham, Villarreal and most recently clubs from Turkey have all been rumoured to hold an interest in the youngster. For this reason, and no disrespect to Al Jazira, it appears to be a step-down. Although perhaps it is an indication that Lanzini has not reached the levels expected and so these clubs did not ever firm up their interest. Besiktas were the only other side to officially register a bid but talks collapsed after the Turkish side were unhappy with River’s negotiations. River President, Rodolfo D’Onofrio explained that Lanzini wished to leave and that was another reason behind the move. “The idea was to keep everyone, but we had to sell some. In the case of Lanzini it is not that we chose to sell, but the offer from Arabia is good and he wants to go, so we can not hold“. Lanzini’s departure leaves a gap in River’s midfield with new boss, Marcelo Gallardo expected to play with an enganche. This would have been Lanzini, one would have thought, but with the season starting today, River will now rely on new signing, Leonardo Pisculichi. Alternatively, River legend, Pablo Aimar is on the list of players for River to continue negotiations with after the closure of the transfer window. The 34-year-old is a free agent since terminating his contract with Malaysian side, Johor Darul Takzim and if he can prove his fitness he will certainly soften the blow of Lanzini’s loss.